A war has been waged and the knights of the realm have returned triumphant! In honor of their victory, the King has called for a great feast and grand tournament to be held in his magnificent castle. As six bold knights prepare for the festivities, the King's chancellor calls the 1,100 guests into the spectacular dining hall. Once seated, a bountiful four-course feast is served in true medieval fashion - without the silverware! Then, as the final course is served, the romance, adventure and gallantry of a full scale jousting tournament reaches fever pitch and the final battle of the night begins! 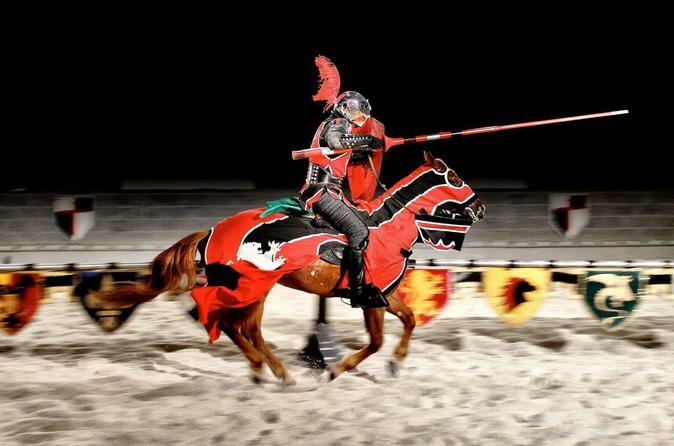 Medieval Times Dinner and Tournament is a legendary experience and is available from with pick-up from most hotels. It's a great way to round out your busy day of sightseeing in Southern California.